My Elder son, Xavier, have been saving regularly for the past few years. He used to have 99.9% of his savings from the ‘passive income’ that he recieved from the red packets during Chinese New Year, his birthday and what we gave him. When his younger arrived, I decided that he should know about ‘active income’ and the need to work for money. I got him to do some chores such as throwing away his younger brother’s diaper and he is paid $0.50 each. A diaper with solid waste can earn him $1. The lesson to him is he will need to do all these job in future if he don’t study hard now. He was also taught that he could earn the same $1 the by working harder. He only experienced with cash inflow all this while. After spending 6 months in P1 and saw the ‘real world’ of nothing is free. I decided to teach him about cash outflow as well. 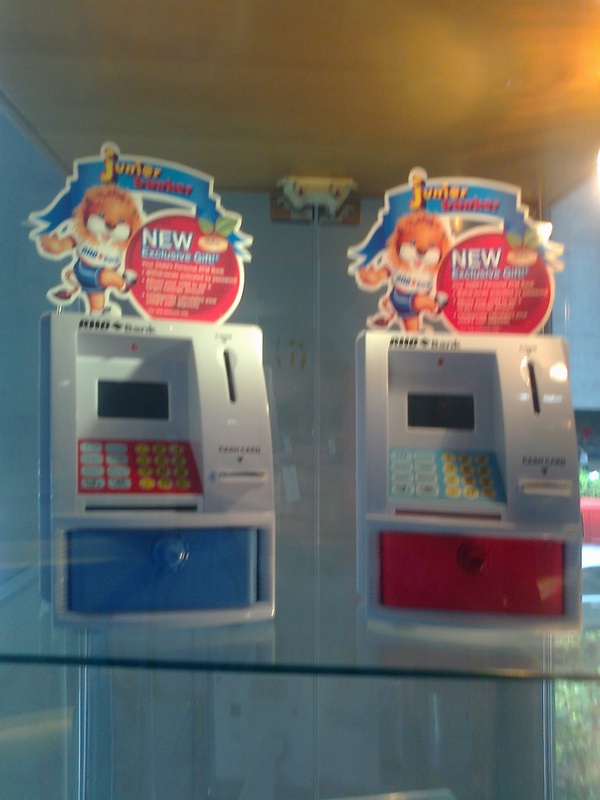 On a side note, I strongly encourage parents to get this piggy bank(on the left) that look like an ‘ATM’ for your kids. It has the function to decide what is your saving target and to decide how many days you wish to achieve the target. It will also count the amount of coins you had ‘deposited’ & when you withdraw the cash frm this machine, a password & ‘ATM card’ is needed. The amt will also be less off from the balance and it shows you what’s the shortfall from your targeted savings. All you need is SGD500 to open & maintain the Junior Banker a/c with RHB Bank. There are 3 savings accounts that Xavier will need to keep. The 1st which is also the most important account is the ‘ATM piggy bank’. It allows him to set a clear target and see his shortfall from his target. The card is kept away from him so he cannot withdraw any money from it. This account is purely for savings! The last account is the piggy bank from OCBC. Any extra money from the above two accounts will be save here. This account is meant for spending. I had told him that I will take money from this account if he buys toys or other unncessary items. However, I had not told him that I will still ‘refund’ into his 1st account. Sounds complicated??? I taught him an easy way to remember. The savings account need not be bother since he cannot take any money out from it. 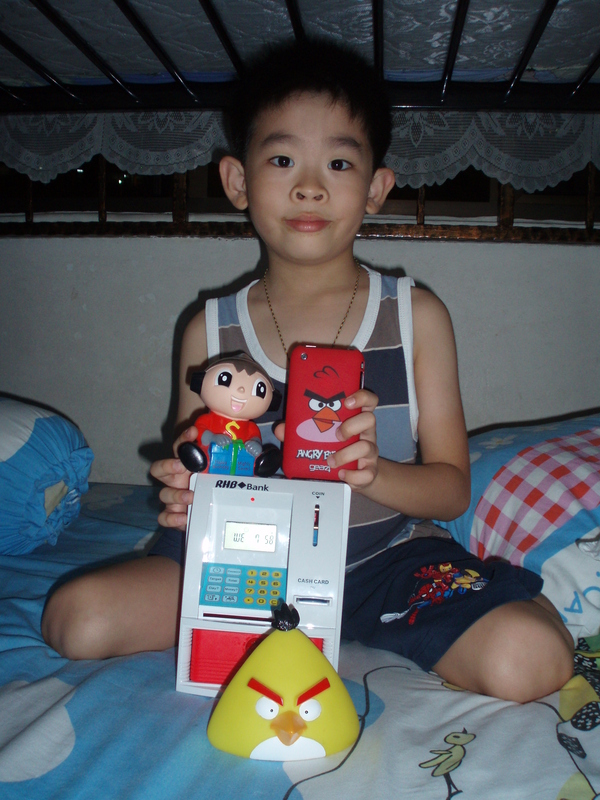 The 2nd account which is from the angry bird is for daddy & mummy. I told him, ” Just remember that if you don’t give me money, I will become a angry daddy.” The 3rd account for spending is easy to remember as you can see a ‘S’ -shape on the piggy bank and it stands for ‘spending’. I modified some of these ideas from ‘MoneyTree (Singapore)’ which specialise in Financal Literacy program for children. Previous He modifies car, insurer voids policy. Next What do you look for in a medical insurance?